Endocrine diseases: hypothyroidism, hyperparathyroidism, ketoacidosis. PURINE METABOLISM AND URIC ACID SYNTHESIS SCHEME OF RENAL EXCRETION OF URIC ACID Depending on the daily amount of excreted uric acid 3 groups of patients are typically singled out. They are the following: “overproducers”, “hypoexcretors” and mixed defects. “Overproducers” make up 10% of all patients with gout. When the diet is usual, they excrete more than 750 – 1000 mg of uric acid daily. 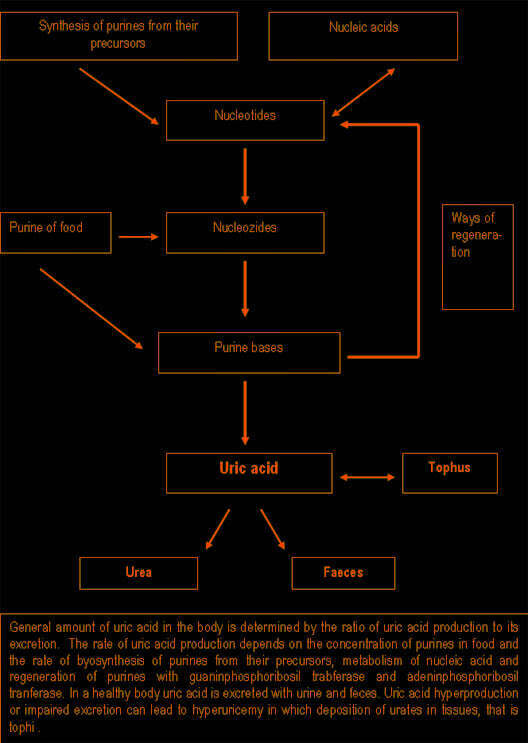 Increased production of uric acid occurs in catabolism of nucleic acids. The primary cause of increased production of uric acid involves defects of the enzyme system of uric acid synthesis. The secondary cause includes increased breakdown of cells in alcoholism, blood diseases, chronic hemolysis and antitumor chemotherapy. “Hypoexcretors” make up 90% of all patients with gout. They excrete less than 700 mg of uric acid daily. Hyperuricemy is considered to be caused by reduced renal excretion of uric acid. Reduced secretion of uric acid in proximal tubules can lead to hyperuricemy even if uric acid production rate is normal. Increased reabsorption in distal parts of proximal tubules may also lead to hyperuricemy and gout. 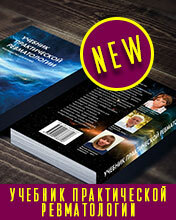 It occurs if the volume of extracellular fluid is decreased. Mixed hyperuricemy. Sometimes hyperuricemy can be caused by a combination of factors such as increased production and reduced excretion of uric acid. Obesity, diabetes mellitus, arterial hypertension, hyperlipidemy, atherosclerosis are often seen in patients with gout. Pathogenesis of gouty arthritis. Clinical manifestations of gout are associated with deposition of urate crystals in tissues. The mechanism of urate deposition remains unclear. Insufficient vascularization of tissues is of great importance. Factors which contribute to the formation of urate crystals include urate concentration, local temperature, pH of blood serum and presence of proteoglycans that is substances which retain urates in fluid. Increased water diffusion from the joint can lead to increased urate concentration and their crystallization. Urate solubility depends on the temperature of the environment: overcooling of peripheral joints can lead to urate crystallization and formation of microtophi. An acute onset of gout can be triggered by neutrophilic reaction to urate crystals. It typically leads to activation of humoral and cellular inflammatory mechanisms. Urate crystals activate the complement system both in the classic and alternative way. Besides, contact activation of coagulation factor XII (Hageman’s factor) which stimulates production of bradykinine, kallikrein and plasmin occurs. Ig and components of the complement system opsonize urates and stimulate phagocytic activity of neutrophils. Lysosomal enzymes, free oxygen radicals, leukotriene and prostaglandin metabolites, collagenase and other proteases release from neutrophils. Phagosomes of neutrophils which absorb crystals bind with lysosomes. Lysosomal enzymes, however, destroy the protein capsule of crystals. 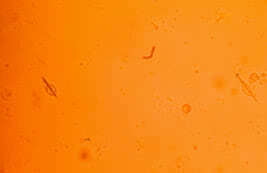 Crystals damage neutrophils, while lysosomal enzymes which are released into the synovial cavity initiate inflammation. Neutrophils are substituted by macrophages. Prostaglandins (PgE2), lysosomal enzymes, TNF-alpha, IL-1 and IL-6 release from macrophages under the impact of urate crystals. Synoviocytes also contribute to the development of inflammation, releasing IL-8 and other cytokines. Since uric acid can cause release of inflammatory mediators from synovial macrophages, other joints and soft tissues are involved into the inflammatory process. The pH decreases contributing to further crystallization of urates. Thus, a pathogenetic vicious circle arises. The factors which limit the course of acute gouty arthritis remain unknown. However, they are likely to be linked with “anti-inflammatory” mediator synthesis such as receptor antagonist IL-1, transforming growth factor-B, etc. 2. According to the mechanism of accumulation of uric acid, the following types of gout are singled out: 1) Metabolic (hypersecretory) type 2) Hypoexcretory type 3) Mixed type 3. According to the clinical course of the disease, the following types of gout are singled out: 1) Asymptomatic hyperuricemy 2) Acute gouty arthritis 3) Gout associated with the development of tophi 4) Urolithiasis or some other kidney disease associated with gout 4. According to the clinical course of arthritis, the following types are singled out: 1) Acute gouty arthritis 2) Intermitting arthritis 3) Chronic arthritis associated with deposition of paraarticular tophi 5. According to the severity of the disease, the following types of gout are singled out: 1) Mild 2) Moderate 3) Severe Clinical manifestations. Clinical manifestations include joint and internal organ involvement. Joint involvement is the most common clinical manifestation of gout. 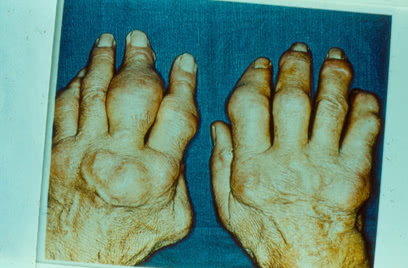 Acute gouty arthritis is the most common manifestation. Attacks of gout are often triggered by overindulgence in certain foods, alcohol consumption, physical or emotional strain, trauma, overcooling, infection, surgical intervention, fasting, weight loss, or medications. Mental and emotional disturbances typically occur in a prodromal period. They usually include bad mood, depression, anxiety, fear, hyperexcitability, irritability, etc. Dyspeptic disturbances, aching all over, rapid fatiguability, dysuric disturbances, heart pain, high arterial pressure are also common in a prodromal period. In acute gouty arthritis only 1 joint is usually involved. Typically, they are lower-extremity joints. In 50% of patients the first metatarsophalangeal joint is the first to be involved. Acute attacks of gout usually occur at night and are often associated with increased erythema and high temperature in the area of the joint. The joint becomes swollen and painful. The patient usually feels sharp pain which aggravates when lowering the extremity. All components of acute inflammation in the affected joint are usually well pronounced. The range of motion in the joint is limited. In severe cases of gout fever (38 – 39ºC), leukocytosis, increased erythrocyte sedimentation rate are typically seen. The bout usually lasts for several days, less commonly – for several weeks. The attacks resolve spontaneously with return of the joint to normal condition between attacks until chronic gouty arthritis develops. Approximately 7% of patients do not develop recurrent attacks after the first episode of gout. 75% of patients tend to develop the second attack after 2 years, and 62% develop recurrent attacks of gout during the first year. Untreated, the clinical characteristics of acute gouty arthritis change over time and become chronic. The intervals between episodes of gout become shorter, and the episodes proper become longer. They usually have a migrating character and more joints may become involved, although pain may become less intense. In this case tophi typically occur. In chronic gouty arthritis attacks usually occur more frequently and may last for several weeks. Continuous episodes of mono-, oligo- and polyarticular arthritis associated with pronounced inflammatory reactions may persist for several months. 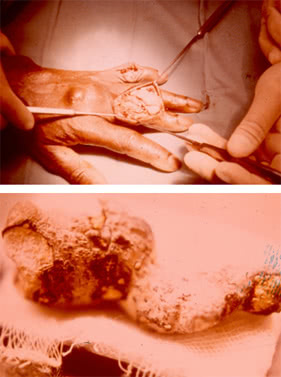 Tophi are collections of uric acid crystals encircled by inflammatory cells and fibrous masses. They typically occur along the helix of the ear. They can be found in the affected joints, in the subchondral part of the articular surface, extensor surface of the forearm, in the cubital region, along the Achilles and popliteal tendons. Tophi can develop in any part of the body and even in internal organs. The rate of tophus formation depends on the severity of the disease and duration of hyperuricemy. Sometimes tophi may soften, open spontaneously resulting in the formation of fistulas releasing a white mass which resembles a toothpaste. Microscopy of the latter reveals crystals of uric acid potassium. Extraarticular manifestations. Renal involvement is most common in gout. In purine metabolic disorders kidneys are often involved. The prevalence of renal involvement in patients with gout varies within the range of 30 – 75%. The risk for developing renal involvement in patients with gout is proportional to the duration of the disease and the extent of hyperuricemy. Gouty nephropathy is a notion which covers all renal diseases, which occur in patients with gout such as tophi in renal parenchyma, urate calculus, interstitial nephritis, glomerulosclerosis, arteriolosclerosis and arteriosclerosis with the development of nephrosclerosis. Sometimes changes which are typical of glomerulonephritis occur in gout. It is clinically manifested by a latent course, hematuria and rapid progression of the disease. Episodes of reversible renal dysfunction are common in glomerulonephritis in patients with gout. Urate nephropathy is a late manifestation of severe gout that can lead to the development of chronic renal failure. Histologic examination of the interstitial tissue and renal pyramids reveals masses of crystals of monopotassium salt of uric acid encircled by gigantic cells. This type of renal involvement occurs quite rarely, and if there is no gouty arthritis, it cannot be diagnosed. It may be asymptomatic or it may be manifested by proteinuria, arterial hypertension and renal failure. Acute hyperuricemic nephropathy is caused by crystallization of uric acid in renal canaliculi and tubules, resulting in impaired urodynamics and reversible acute renal failure. Acute hyperuricemic nephropathy may be caused by a sudden increase of uric acid production and increased concentration of uric acid in urine. Dehydration and acidosis contribute to crystallization of uric acid. Acute hyperuricemic nephropathy is common in patients with blast crisis. It is often observed after treatment with cytostatics (tumor lysis syndrome), after epileptic seizures, physical strain and overheating. Hepatic involvement is due to the formation of gouty nodes in the liver. Specific eye involvement includes iritis, iridocyclitis, conjunctivitis. Migraine is common in patients with gout.. Allergic reactions typically include eczema or bronchospasmodic syndrome. Gouty phlebitis and spinal cord involvement are also common in patients with gout. Cardiovascular involvement includes severe damage to the valves of the heart due to urate deposition on the cusps. Patients with gout tend to develop arterial hypertension, coronary insufficiency, thrombosis, atherosclerosis. Nervous system involvement includes acute forms of lumbago and radiculitis which typically develop due to urate deposition in the area of intervertebral joints resulting in local inflammation and irritation of nerve roots. Sometimes myositis, tendonitis, tendovaginitis can occur. Imaging Studies. The most common radiographic findings of gout can be seen after 3 years following the onset of the disease. Signs of destruction, degeneration and regeneration are typically observed. They are the following: 1 Large defects of bone epiphysis with sclerotic borders, sometimes called cookie-cutter or punched-out borders; 2 Cystoid (large or oval) defects which can damage the cortical layer of the bone as well as “overhanging edge” symptom. These two features are typically associated with tophi. 3 Sometimes bone erosions such as intraarticular, periarticular, central or marginal can be seen. 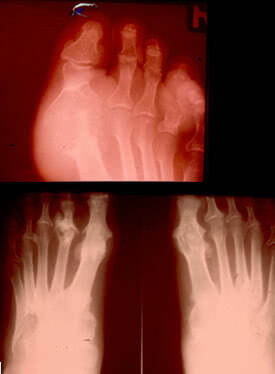 In some cases erosions of bones with osteolysis of epiphysis and diaphysis may suggest gout. They may be substituted by urate masses. The above-mentioned features are typically found in the first metatarsophalangeal joint and phalanges of toes. However, they may occur in any other joint. In acute arthritis there are no specific radiographic findings. These radiographic findings seldom occur nowadays. In most cases radiographs show findings consistent with osteoarthritis or they do not show any changes. Three stages of chronic gouty arthritis are typically singled out. They are the following: 1st stage: Large cysts in the subchondral area of the bone or in its deeper layers. Sometimes soft tissues are sclerosed. 2nd stage: Large cysts in the area of the joint; small erosions on the articular surface as well as sclerosis of periarticular soft tissues, and sometimes their calcification. 3rd stage: Large erosions which do not cover more than 1/3 (one-thrid) of the articular surface; osteolysis of epiphysis, sclerosis of soft tissues and their calcification. Lab Studies. Hyperuricemy with levels higher than 6 – 7 mg%, especially when the diet lacks purines for 3 – 5 days is associated with gout. However, in 10% of cases the concentration of uric acid does not exceed the normal value. Thus, the presence of elevated levels of serum uric acid does not mean that the patient has acute gouty arthritis. Urate crystals are typically found in synovial fluid. Finding intracellular and birefringent urate crystals by polarizing light microscopy firmly establishes a positive diagnosis of gouty arthritis. In acute gouty arthritis urate crystals are typically found in neutrophils. The concentration of urate crystals in synovial fluid is about 10 mcg/ml. Aspiration of tophi content enables us to identify urate crystals. Erythrocyte sedimentation rate (ESR), fibrinogen, leukocytosis, positive diphenylamine test can be elevated in patients with acute arthritis. Diagnosis. A positive diagnosis of gout is typically established considering clinical, laboratory and X-ray findings. Classification criteria of gout (by Wallace et al., 1997) A. Presence of specific mono-potassium urate crystals in synovial fluid. B. Presence of tophi established by chemical analysis or polarizing light microscopy. C. Presence of 6 out of 12 clinical, laboratory and X-ray findings. They are the following: 1. Severe inflammation of the joint within a day. 2. 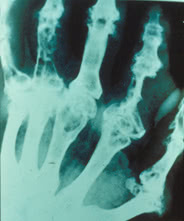 Acute attacks of arthritis. 3. 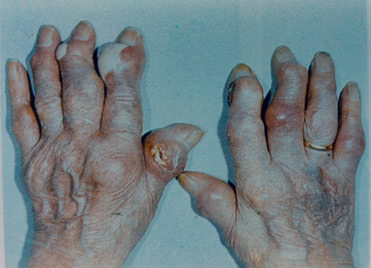 Monoarthritis. 4. Reddening of joints. 5. Pain and inflammation of the metatarsophalangeal joint (MPA) of the first toe. 6. Asymmetric inflammation of the metatarsophalangeal joint. 7. Unilateral involvement of tarsal joints. 8. Tophus formation. 9. Hyperuricemy. 10. Asymmetric joint inflammation. 11. Subcortical cysts without erosions revealed on radiographs. 12. Absence of microorganisms in synovial fluid culture. Revealing urate crystals in synovial fluid and, especially in leukocytes, firmly establishes a positive diagnosis of gout. A relatively low sensitivity of this method (69%), the link between the results of the analysis and the extent of experience of a laboratory worker as well as the amount of crystals and their size should be considered. Differentiation of gout from other diseases. 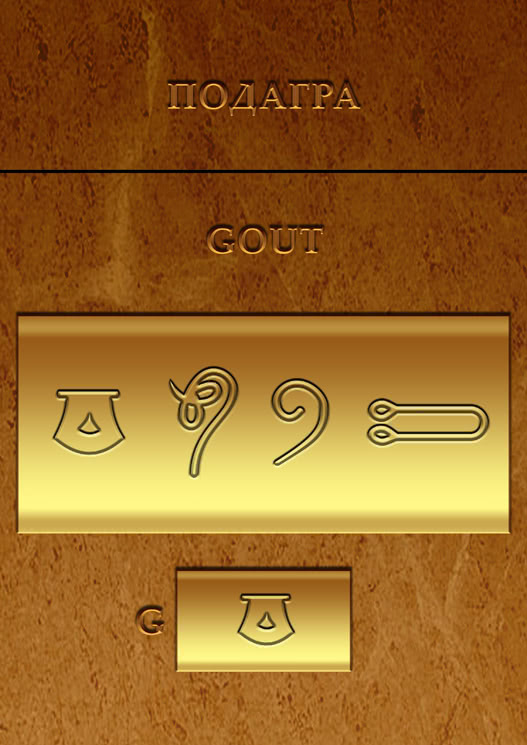 The diagnosis of gout is not usually difficult. 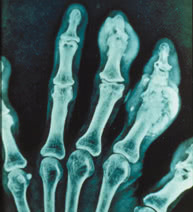 Difficulties in diagnostics of gout may arise when the clinical course of the disease is atypical (for example, no tophi or common radiographic findings are revealed). Gouty arthritis should be differentiated from the following conditions: 1 Acute articular rheumatism 2 Palindrome rheumatism 3 Rheumatoid arthritis 4 Erysipelatous inflammation 5 Osteoarthrosis 6 Infectious arthritis 7 Psoriatic arthritis 8 Reactive arthritis 9 Traumatic arthritis 10 Intermitting hydroarthrosis 11 Pseudo-gout (chondrocalcinosis) 12 Xanthomatosis. TREATMENT Objectives of treatment. The most important objectives of treatment are the following: 1 Rapid and safe control of acute gouty arthritis; 2 Preventing recurrences of the disease; 3 Preventing transition of the disease into a chronic stage which is associated with tophus formation, renal involvement and joint destruction. Asymptomatic hyperuricemy does not mean that the patient must be prescribed a specific therapy. The factors contributing to the disease should be eliminated. Diet modifications in gout can lower the amount of purines entering the body sufficiently allowing to reduce the doses of drugs. Dairy products and vegetables are usually the choice. The needs of the body for calories should be met by eating sufficient amounts of carbohydrates, however, in obese patients total calorie content should be limited. Liver, kidneys, brain, lungs, meat broth, roasted meat and other foods rich in purines should be excluded from the diet. The consumption of beans, lettuce, spinach, sorrel, aubergine, radish, cauliflower, boiled meat, fish, chocolate, coffee and cacao should be also limited. Fat intake should be limited too (not more than 1g/kg). The food should contain sufficient amounts of vitamins, especially ascorbic acid, rutin, riboflavin. Plentiful drinking 1,5 – 2 liters a day, including alkaline mineral water or other alkaline means is indicated. Patients should avoid alcohol because it elevates levels of uric acid and therefore can block renal excretion of uric acid from the body. Acute gouty arthritis Treatment of acute gouty arthritis is more effective at an early stage. There are two classic approaches in the management of acute attacks of gout. They are the following: 1) colchicine treatment, or 2) management of acute gout with nonsteroidal anti-inflammatory drugs (NSAIDs). 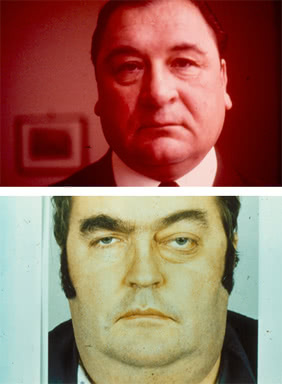 The effects of these two methods of treatment are similar. Colchicine is a short-acting drug, however, it often causes adverse effects. Colchicine is a powerful inhibitor of phosphatase. It inhibits the processes of cell division. Colchicine can be administered intravenously in the single dose of 1 – 2 mg. It can be repeated in 6 – 12 hours, but no more than 1 mg at a time. Contraindications for intravenous administration of colchicine include hematosis depression, renal dysfunction (the glomerular filtration rate is less than 10 mL/min, oliguria or anuria), hepatic diseases (biochemical hepatic indices are 2 times higher than the normal values) and sepsis. Colchicine may be given orally in the dose of 0.6 – 1.2 mg every hour or every 2 hours on the 1st day until the patient feels relief or has adverse gastrointestinal effects. If no effect is observed, colchicine is withdrawn after 10 hours. The duration of treatment with colchicine is typically 2 – 4 days. Prime complications of colchicine administration include toxic effects on the central nervous system (CNS), liver, kidneys, bone marrow. Other complications include nausea, vomiting, diarrhea, pain in the abdomen, neuromuscular disturbances (myopathy), hematologic complications such as leucopenia, thrombocytopenia. Nonsteroidal anti-inflammatory drugs (NSAIDs) are used in large doses and for a short period of time. Most NSAIDs can be used, however, agents influencing the excretion of uric acid such as salicylates, diflunizal, should be avoided. NSAIDs should not be used in patients who have a history of gastrointestinal, hepatic or renal diseases. Intraarticular corticosteroids with obligatory lavage of the joint is an effective means of controlling acute gouty arthritis. Drugs which reduce the concentration of uric acid in an acute period of gouty arthritis are not administered, because any changes of urate concentration in blood may prolong gout attack. However, if the patient took these drugs before acute gouty arthritis, the regimen of administration remains unchanged. Treatment of gout between periods of exacerbation of the disease is aimed at prevention of disease progression. Therefore, weight loss, diet modifications and avoiding alcohol are of great importance. Small doses of colchicine or NSAIDs are typically given as prophylaxis of an acute attack of gout. Such therapy may be used before administration of hypouricemic drugs to reduce the possibility of developing an acute attack of gout until serum uric acid levels become normal. Treatment with drugs lowering uric acid levels should be started only after the attack has resolved. Drugs lowering uric acid levels can be used for prevention of attacks of inflammatory arthritis over the first several months after the attack has resolved. It should be combined with administration of low-dose colchicine or NSAIDs. Allopurinol (a xanthine oxidase inhibitor) prevents the generation of uric acid and it should be used in patients who are overproducers of uric acid. Treating patients with allopurinol may help lower the level of uric acid within the first 2 days, however, the maximum effect is achieved only after 2 weeks. In urolithiasis, daily excretion of uric acid of more than 3,6 mmol (600 mg), acute hyperuricemic nephropathy or the possibility of its development, allopurinol should be given, while uricosuric drugs should be avoided due to high risk for developing nephropathy and urolithiasis. The recommended dose depends on the amount and size of tophi as well as on renal function. 400 mg of allopurinol has a pronounced hypouricemic effect; once the target level of uric acid is achieved, the maintenance dose of 100 – 200 mg daily is administered. Allopurinol turns out to be ineffective if the patient doesn’t take the drug regularly. Allopurinol may be used once a day, however, in renal failure the dose should be lowered. If the patient does not have hyperuricosuria, either allopurinol or uricosuric drugs can be used. Uricosuric drugs increase renal excretion of urates mainly by inhibiting tubular reabsorption. The goal of therapy is to lower serum uric acid to approximately 5 mg/100ml. It should be remembered that these drugs are ineffective in tophaceous gout with uric acid level of more than 7 mg/100 ml. They are contraindicated in urolithiasis. What is more, they contribute to the development of urolithiasis and do not improve renal function in comparison with allopurinol; therefore, the use of uricosuric drugs is limited. Benzbromaron increases renal excretion of urates (that is, it inhibits tubular reabsorption). Benzbromaron also inhibits synthesis of purine bases and absorption of uric acid in the intestine. The daily dose of benzbromaron is 100 – 200 mg. It should be used once a day. Probenecid has a uricosuric action and it reduces joint inflammation. When probenecid is used, the risk for developing crystaluria and urate crisis is very high. The initial dose of probenecid is 0,25 g 2 times a day. Once the target level of serum uric acid is achieved, the dose should be increased every 1 – 2 weeks by 0,5 g (the maximum daily dose is 3 g). Patients often develop resistance and some significant adverse effects when using probenecid. Sulfinpyrazone. The initial daily dose is 100 mg. It should be divided into 2 doses per day. If the target level of serum uric acid is not achieved, the initial dose should be gradually increased by 100 mg (not more than 800 mg) after 3 – 4 days. The maintenance dose is 300 – 400 mg/daily for 3 – 4 administrations. Patients often develop dyspepsia when using sulfinpyrazone. However, the more significant concern is hematosis supression. Allomaron is a combined drug which has a pronounced normalizing action on purine metabolism. It has a uricosuric and uricodepressive effect. Every tablet of allomaron contains 0,1 g of allopurinol and 0.02 g of benzbromaron. The daily dose is 1 tablet a day after meals. A small amount of water should be taken with the tablet. In severe cases 3 tablets of allomaron can be used daily. Criteria of effectiveness of treatment. If the optimum level of serum uric acid is achieved within the first months after initiating treatment, the treatment is considered to be effective. The optimum level should not exceed 6 mg% (in men); it is typically 4 – 5%. If the concentration of uric acid does not lower to 6,8 mg%, it means that urates are not dissolved in extracellular fluid and tissues. Therefore, the patient runs the risk of developing acute attacks of gout. After 6 months following the beginning of treatment one decides on its effectiveness. The treatment is considered to be effective if the patient seldom develops gout attacks. Dilution of subdermal tophi, renal function and absence of progression of urolithiasis are also considered. Acute hyperuricemic nephropathy. To lower the concentration of uric acid in tubules, large amounts of furosemid are given intravenously. Diuresis should be more than 100 ml/hour. Oral administration of 240 – 500 mg of acetazolamide every 6 – 8 hours and intravenous administration of potassium carbonate alkalinize the urine and increase solubility of uric acid. Hypervolemia and reduction of the pH of urine (less than 7) should be prevented in patients. Along with this, allopurinol in the single dose of 8 mg/kg is typically administered to reduce the production of uric acid. If these measures are ineffective, hemodialysis is usually undertaken. Gout tophi tend to open spontaneously resulting in the formation of fistulas releasing urate crystals. In this case baths with hypertonic solution are advisable. Tophi do not usually suppurate due to bactericidal properties of uric acid. Tophi should not be surgically removed due to poor wound healing. Enterosorption. The goal of enterosorption is to reduce reabsorption of uric acid in the gastrointestinal tract. Poliphepam, enterodez and absorbed carbon are typically used as enterosorbents. Extracorporal hemocorrection. The method of extracorporal plasma exchange with modified autoplasma is advisable. The method was developed on the basis of crioplasmosorption technique. Treatment typically includes 4 – 5 courses, with the interval of 2 – 3 days. Repeated courses should be performed every 6 – 8 months. Efferent therapy is the method of choice in patients who are intolerant of other drugs or show resistence to them. Efferent therapy is also used in progressive gouty nephropathy in combination with traditional medications. Physiotherapeutic treatment should not be started during an acute attack of gout. Hydrosulfide baths, paraffin-ozokerit or mud applications, radon baths, ultraviolet irradiation, diadynamic currents, electrophoresis with novocain, fonophoresis with hydrocortisone, massage, remedial exercises are typically advised. Sanatorium-and-spa treatment plays an important part in the treatment of gout. Therefore, resorts such as Goryachij Kluch, Pyatigorsk, Mineral’nye Vody, Sochi-Matsesta, having hydrosulfide baths and radon sources as well as mud cure resorts such as Anapa, Evpatoria, Staraja Rusa and balneotherapeutic health resorts such as Essentuki, Zheleznovodsk, Feodosija should be considered as they may help improve the symptoms. Prevention. Primary: It foresees detection of asymptomatic hyperuricemy in relatives of patients with gout as well as treatment of hyperuricemy with the help of diet modifications aimed at prevention of acute gout attacks. Secondary: It envisages early detection and treatment of gout, prevention of recurrent gout attacks as well as elimination of extraarticular manifestations of the disease, especially nephropathy. Prognosis. Prognosis is determined by concomitant cardiovascular involvement and renal failure. A mortality rate of 18 – 25% is due to renal failure. Progressive nephropathy associated with arterial hypertension and diabetes mellitus is a poor prognostic factor. Joint involvment may decrease considerably capability of people, and sometimes it can lead to disability. The patient may not develop tophi or joint dysfunction for many years if urates are properly excreted.